The distance between the two Mexican towns was 28 miles — a little more than a marathon or, in the context of the entire migrant journey across Central America and Mexico, just one tiny step. Under the blazing afternoon sun, the caravan looks like a listless mass of exhausted bodies splayed in any available shade. The action happens in darkness, in the early morning hours before dawn. And so at 3 a.m. on Saturday in the town of Arriaga — home to a railroad depot in the southern state of Chiapas — thousands of aspiring Americans were already on their feet and ready to move. “Which way is it?” someone shouted. “To the north!” another called back. To get from one stop to another — in this case the town of San Pedro Tapanatepec — requires surmounting myriad obstacles. The most basic are matters of survival: How to endure walking miles in searing heat without dependable sources of water and food. The difficulties are also political, for a group of several thousand people whose trip is challenging the laws of Mexico and provoking rage from President Trump. Theft is always a concern, as are losing track of relatives. And yet, the caravan is still a swollen river of humanity, determined to keep moving. 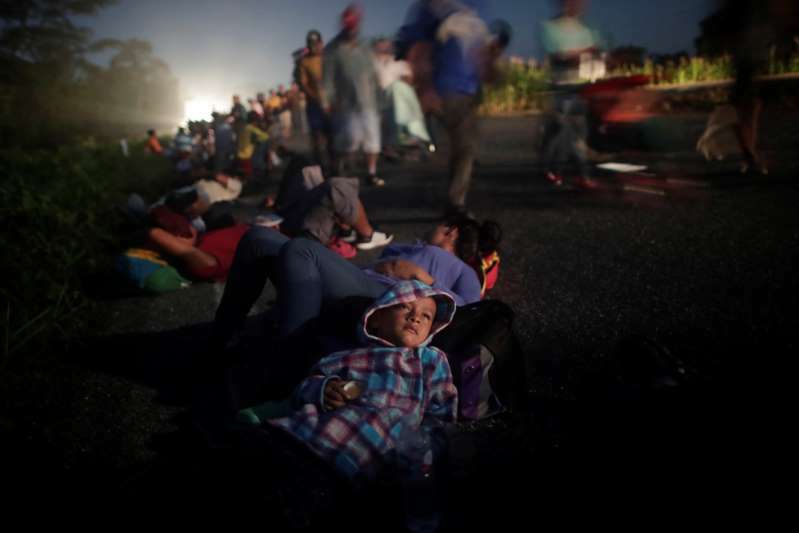 Over the past 15 days, starting in San Pedro Sula, Honduras, this caravan, between 3,000 to 7,000 people, according to different estimates, had traveled nearly 600 miles. Another 2,200 miles remained to reach their destination in Tijuana, along the U.S. border. The migrants walked out of Arriaga under a nearly full moon amid skittering street cats and the sharp smell of overburdened latrines. Husbands held hands with their wives, and parents pushed strollers. They crossed the train tracks and headed northwest on Highway 200. There were small moments of levity. Three migrants hopped a ride on the back of a passing truck only to have the truck take the first exit. “Look, they’re going backwards,” someone called out, laughing. The two-lane road passed through farmland, the mountains beyond looming as dark silhouettes in the distance. Vega had already lived in the United States, putting up sheet rock in New Orleans until he was deported in 2006 after a fight in a pool hall. Back in San Pedro Sula, Honduras, he sold coconuts, earning about $15 a day. He joined the caravan to pull himself and his family one notch higher. It was 5:20 a.m., and the caravan ground to a halt. Word trickled through the group that more than 100 Mexican federal police in riot gear had sealed off the road ahead. The caravan organizers huddled with migrants to strategize. They had already had one violent clash with police when the group tried to cross the Mexico southern border earlier in the month, resulting in several injuries. David Mendoza, 31, a chatty pastor’s son who was born in El Salvador but lived most of his life in Los Angeles, took a seat on the pavement with the rest of the group. He had on high-top black Converse sneakers and wore his hair in a ponytail — a former regular in the city’s punk rock scene. But the United States was not even on his list of aspirations anymore. He had a DUI and a gun charge on his record, and he figured he would spend time in jail if he got caught crossing into California again. He wanted to make it to Sonora, Mexico, which he had seen in pictures. His deportation earlier this year had been a time to take stock of his life, and he was not happy with the results. While back in La Libertad, El Salvador, some gang members had ordered him to cut his ponytail. “They’ll find any excuse if they don’t like you,” he said. It was more than enough incentive to leave. The caravan sat in the road for more than three hours. Benjamin Grajeda Regalado, head of Mexico’s Gendarmerie, a division of the federal police, negotiated with organizers. On Friday, President Enrique Peña Nieto had offered the migrants a deal: They could live and get temporary work permits, schooling and medical care in Mexico if they stayed in the southern states of Oaxaca and Chiapas. Most migrants had dismissed it, preferring to try to reach the U.S. border. Grajeda told the organizers the caravan was putting people’s lives at risk and he had trucks available to take people to shelters immediately if they wanted to accept the government’s deal. A migrant representative, Araceli Duenas, told the commander the sun was coming up, they had not eaten, and they needed to get to a safe place to discuss the deal with the group. By 8:30 a.m., the riot police had cleared the road and with a cheer, the caravan moved on. There was still 20 miles to go to San Pedro Tapanatepec, and three crucial hours of cool temperatures had been lost. The rest of the way turned into an excruciating march. With the sun up, the temperature reached 104 degrees, and there was painfully little shade on the route. A passing driver dropped a crate of bottled water in the road, and a mob tore it apart. The same thing happened when the caravan passed the Gugar soda factory, and a donated tub of soda prompted a fierce struggle for a bottle. As the hours and miles wore on, conserving energy under the burning sun was the sole grim focus. Some fainted from the exertion. It became an intense competition to clamber on board any passing vehicle, from tractors to chemical trucks, and there was always more demand than space. Migrants piled onto the roof and clung desperately to the sides and backs of cargo trucks. The biggest prize was the rare flatbed truck, where dozens could ride with relative ease. By early afternoon, much of the caravan had stumbled into the town square of San Pedro Tapanatepec and collapsed on the ground. Mothers nursed their babies and tried to tuck them into slices of shade. Lucy Diaz, 56, sat on a concrete step grimacing at the massive open blister on the sole of her left foot. “I’ve lost my toenails,” she said. She had also lost her 15-year-old grandson, who had climbed onto a different truck, and she did not know how to find him. It was because of her grandson, and her desire to keep him out of the gangs of San Salvador, that she had considered the caravan. “Exhaustion means nothing in the face of those risks,” she said.